I love Georgia O’Keeffe’s paintings and will post more about her next week. With a busy weekend ahead I don’t have much time to post so I’ll keep this short. She painted White Bird of Paradise during a trip to Hawaii. 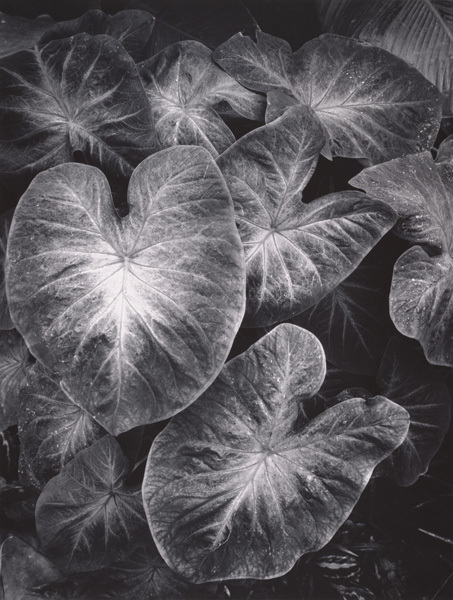 If you happen to be in Hawaii sometime between now and September this piece is featured in an exhibition alongside work by Ansel Adams (apparently they were friends). Wish I could go! In all her work we see a blend of abstraction and realism resulting in a style that is uniquely her own. 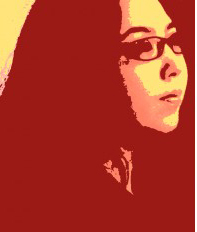 In this piece she achieves depth through changes in value, temperature and overlapping forms. One of my favorite web comics does a nice job describing her paintings. Friday Favorite posts are where I share works of art that I admire. To see more Friday Favorites, click here. 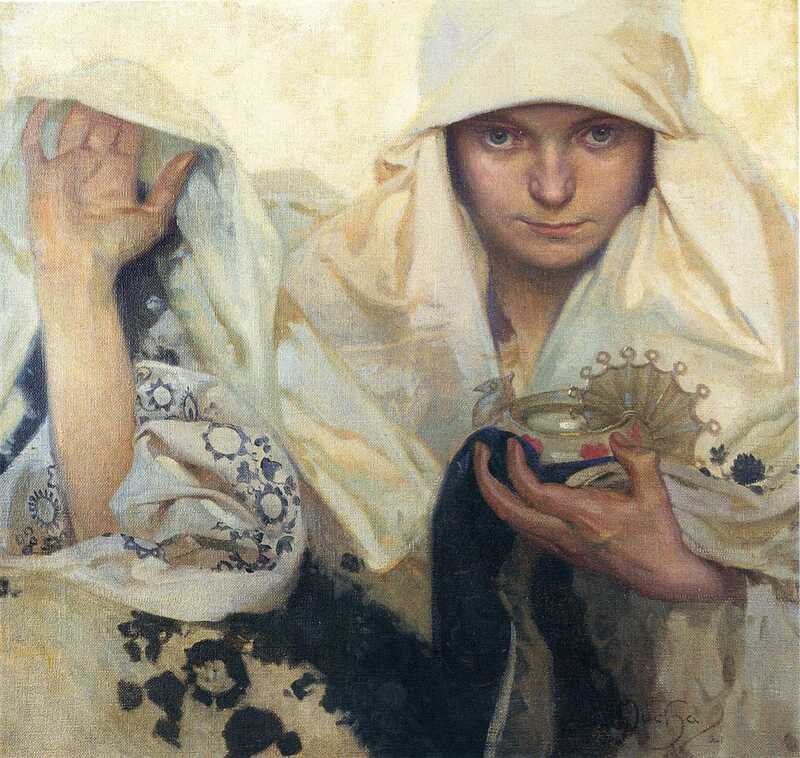 Though Alphonse Mucha is more than capable of using value to describe form as seen by clicking here, in many of his illustrations he chooses not to. He uses color and value contrast within the work itself, but not to describe the volume of form or to describe the volume of the form very minimally. Instead he relies on gesture and line. This is a wonderful example of how much can be accomplished even while using fewer values. He uses beautiful lines that alternate between straight geometric and curves adding variety and interest throughout. 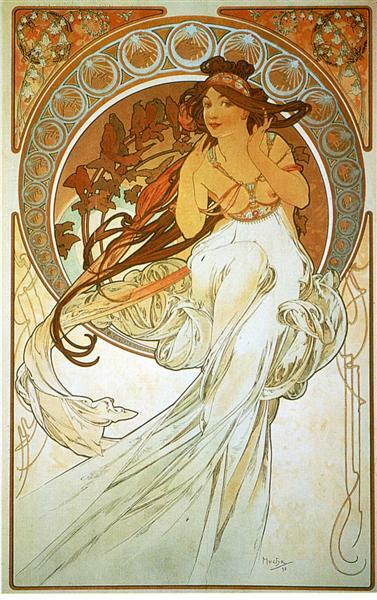 Mucha’s work always has a beautiful feeling of rhythm and flow. Many of his paintings of women remind me of nature and the moon goddesses. The shape she sits on resembles a full moon framed by a crescent moon overhead. Further back receding in space, there is another glowing moon. Friday Favorite posts are where I share works by artists who inspire me. To see more Friday Favorites, click here. Van Gogh considered himself to be the painter of sunflowers, rightfully so as he is arguably most famous for these paintings. This subject was so dear to Van Gogh, who described them as a symphony of yellow and blue, that in a way they can be seen as a self portrait of him. Once cut sunflowers wither fast so Van Gogh had to work quickly to capture what he saw. Here we see the transition of the sunflower from upright to nearly drooping. They’re commonly interpreted as signifying the impermanence of life though Van Gogh is quoted as saying that they might represent gratitude. An alternative explanation is that they carry religious symbolism. Van Gogh’s father was a pastor and Van Gogh tried to follow in his footsteps. 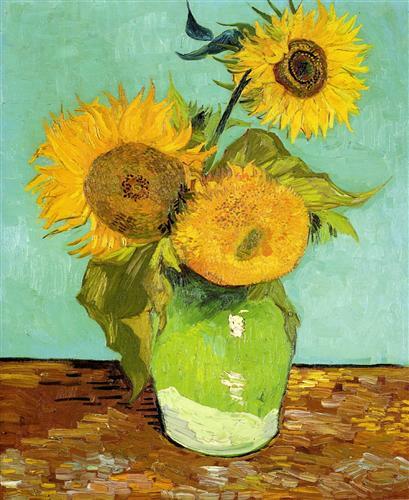 The following art blog poetically describes his sunflowers as representative of Van Gogh’s search for sun and pure light as well as a metaphor for his search for God. Regardless of interpretation, each one of these that he painted is a masterpiece. Below is an excellent BBC Documentary. It’s a longer video, but for worth watching if you’re a Van Gogh fan. Since I missed last Friday, I’m posting two Friday Favorites this week (on a Saturday, though it might still be Friday somewhere…). Sticking to a schedule isn’t my strong suit, but I’m trying so bear with me! 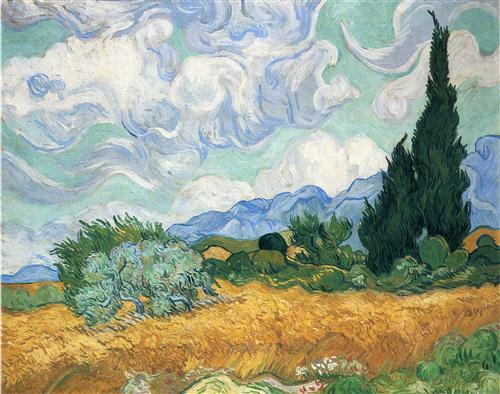 I have many favorites, but Van Gogh has always been my all time favorite artist. His work is what originally got me interested in painting. As I grow and discover new artists and styles, I always return to his work for inspiration. I love so many of his paintings and he has such a wide body of work that there is no doubt I will be posting more from him in the future. With Van Gogh precision and accuracy are not his focus. He uses bold, rapid and expressive strokes to capture what he sees in the moment and by doing so he is able to uniquely capture the feeling and essence of his subject. 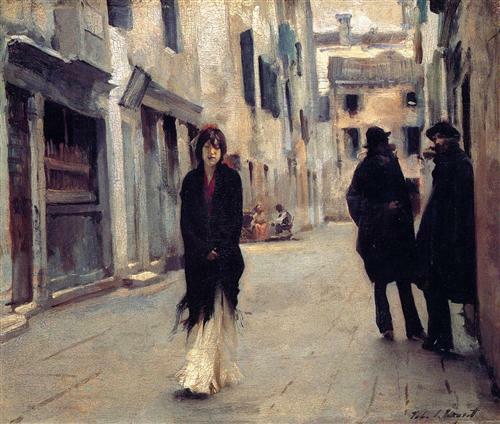 In art school we’re learning how to paint and draw with greater accuracy, but personal style and rhythm is something that they cannot teach us and is something we have to develop on our own. For me, Van Gogh’s work represents a triumph of the kind of individual expression that cannot be taught in a class, but must be learned through self discovery and experimentation. Friday Favorite posts are where I share works by artists who influence and inspire me. To see more Friday Favorites, click here. Spring semester has started so I’ve been busy with assignments and missed posting last week. Though this week’s post is a day late, better late than never. Sticking to a schedule is challenging for me, but I’m trying!